From way up in space, even one of the largest living animals on the planet seems small. But no matter -- scientists have found a way to spot whales from high in the atmosphere regardless, and are now using it to count populations. 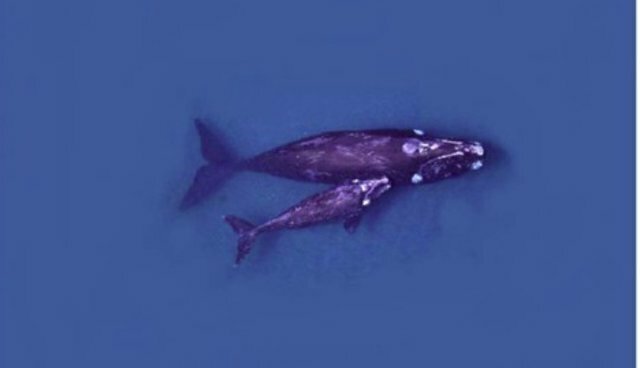 Scientists at the British Antarctic Survey are using high-resolution satellite imagery as research to count southern right whale populations breeding off the Argentinian coast. 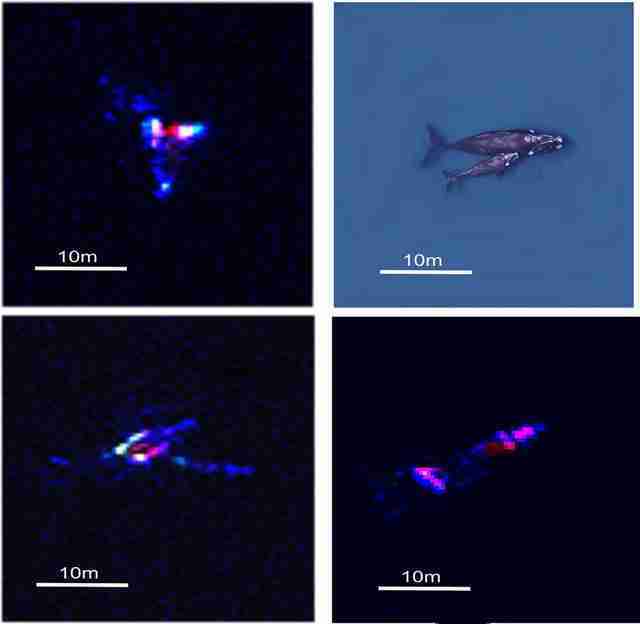 For their study, which was published in the journals PLoS One, the team manually identified whales from an image that covered 44 square miles, counting 55 probable whales, 23 possible whales and 13 other underwater objects that were not whales, like rocks. Then, they employed an automatic program to count the whales, which located 89 percent of the probable whales that they had counted manually -- a good sign that the technology could be relatively reliable in counting the animals. Images via DigitalGlobe/British Antarctic Survey The technique is a huge advance for population surveys, which are essential for conservation policy, but often difficult to attain with accuracy. Before this, scientists have relied on estimating whale populations by searching for blowhole sprays and tail flips from the bows of ships -- a method that relies on chance encounters with the animals and tends to produce inaccuracies. "If you are very skilled, you can judge how far away it is and work out the species from the size and shape of the blow," Peter Fretwell, a researcher for the British Antarctic Survey, told LiveScience. "But it's very difficult, and you have to look in the right place at the right time." 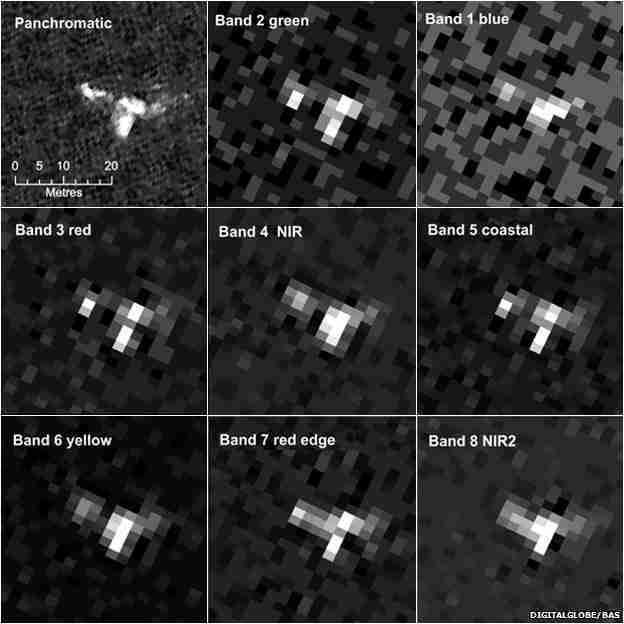 But satellite imagery could make that process a whole lot easier. "Whales populations have always been difficult to assess, traditional means of counting them are localized, expensive and lack accuracy," Fretwell said in a release." The ability to count whales automatically, over large areas in a cost effective way will be of great benefit to conservation efforts for this and potentially other whale species." Knowing how many of a species is critical for good conservation policy -- it can help inform lawmakers of where to devote the most funding and, essentially, which species need the most saving. Southern right whale populations have risen in recent decades to several thousand individuals, thanks to the International Whaling Commission's global moratorium in 1986. But like most other whale species, their numbers are still paltry when compared to their historic abundance -- a fact that the researchers hope will be changed by this new technology.